Showing items in category Malta, sorted by newest listed first. MALTA - 1918 registered cover with 1/2d (x2) and 3d 'War Tax' adhesive use. 1918 (JY.20.) 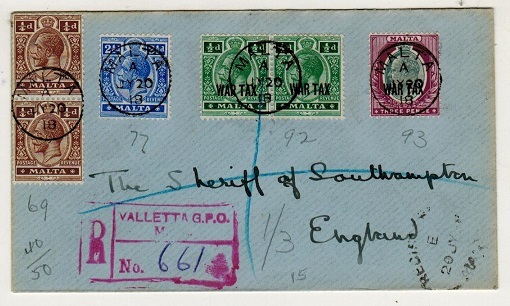 registered cover addressed to UK bearing 1/4d (x2) and 2 1/2d adhesives tied alongside 1/2d green 'War Tax' pair (SG 92) and scarcer 3d 'War Tax' (SG 93) by s/r MALTA cds's. MALTA - 1919 1/2d 'War Tax' (x3) censor cover to UK. 1919 (JY.21.) 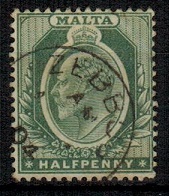 cover addressed to UK bearing a 1/2d green pair tied alongside 1/2d 'War Tax' issue (SG 92) by VALLETTA/MALTA cds with black triangular PASSED BY CENSOR/No.4160 crowned h/s below. A scarcer genuine censored use of this war tax stamp on cover. MALTA - 1943 2 1/2d rate 'OPENED BY EXAMINER/ DD/28' censor cover to UK used at BIRCHIRCARA. 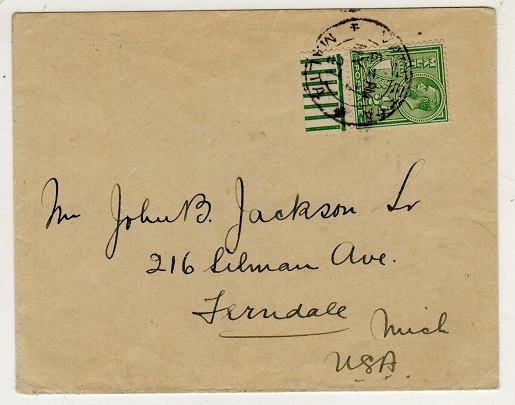 1943 (circa) cover addressed to USA bearing 2 1/2d adhesive tied BIRCHIRCARA and with black on white OPENED BY/EXAMINER DD/28 censor label at left tied by green '3' handstamp. MALTA - 1943 2 1/2d rate 'OPENED BY EXAMINER/ DD/30' censor cover used at COSPICUA. 1943 (circa) cover addressed to USA bearing 2 1/2d adhesive tied COSPICUA and partly overstuck by black on white OPENED BY/EXAMINER DD/30 censor label tied with green '11' handstamp on reverse. 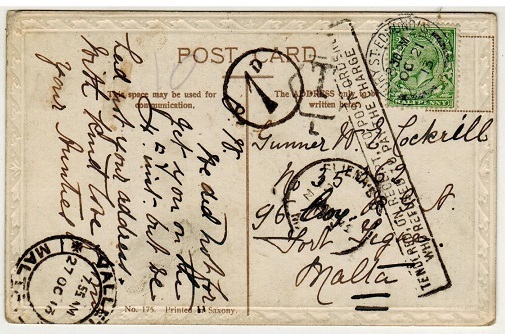 MALTA - 1906 1d rate postcard use to UK with NOT TRANSMISSIBLE handstamp applied. 1906 (JA.4.) 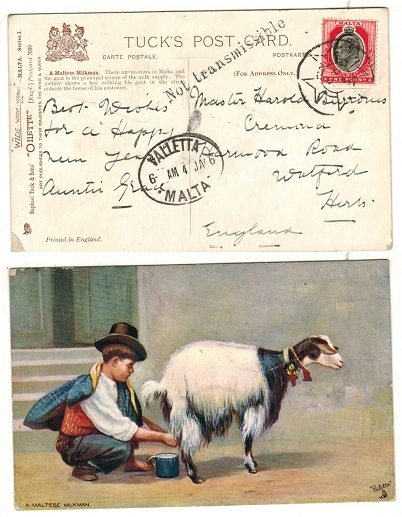 use of coloured picture postcard addressed to UK depicting 'Maltese Milkman ' bearing 1d adhesive tied by circular 'Maltese Cross' cancel with oval VALLETTA/MALTA cancel at left and struck by scarce black NOT TRANSMISSIBLE instructional handstamp. Proud type II4 used only between 1905 and 1909. MALTA - 1943 2 1/2d rate 'DD/28' censor cover to UK used at VALLETTA. 1943 (JU.15.) 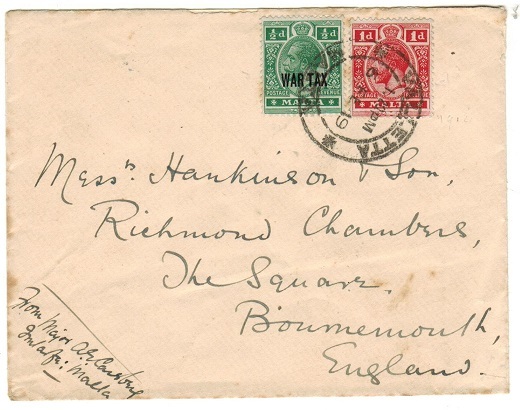 cover addressed to UK bearing KGV 1d 'Postage/Revenue' pair tied with KGVI 1/2d by VALLETTA/MALTA cds and with black on white OPENED BY/EXAMINER DD/28 censor label at left. A dual reign censor use. Little type 8 A2. MALTA - 1943 6 1/2d rate registered 'DD/28' censor cover to UK used at VALLETTA. 1943 (SE.16.) 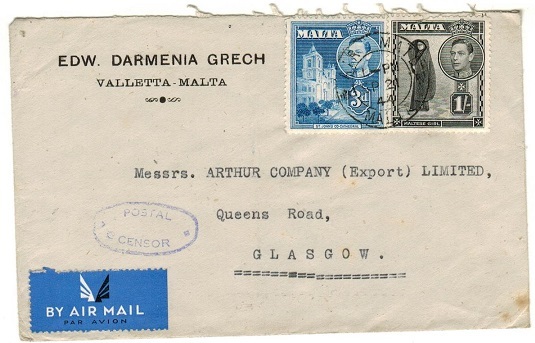 registered cover to UK bearing 1/2d and 6d adhesives tied VALLETTA/MALTA and with black on white OPENED BY/EXAMINER DD/28 censor label at left. Little type 8 A2. MALTA - 1905 (circa) 1/2d rate 'maritime' postcard use to France with 'anchor' cancel. 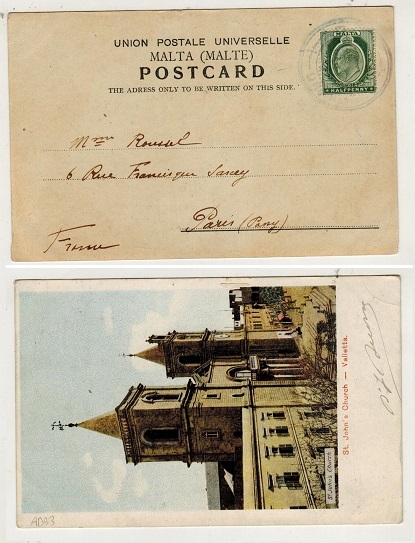 1905 (circa) use of picture postcard addressed to France depicting 'St.Johns Church-Valletta' bearing 1/2d green adhesive tied by large blue inked 'anchor' Italian maritime handstamp. MALTA - 1944 'OPENED BY EXAMINER DD/28' censor cover to UK. 1944 (NO.8.) 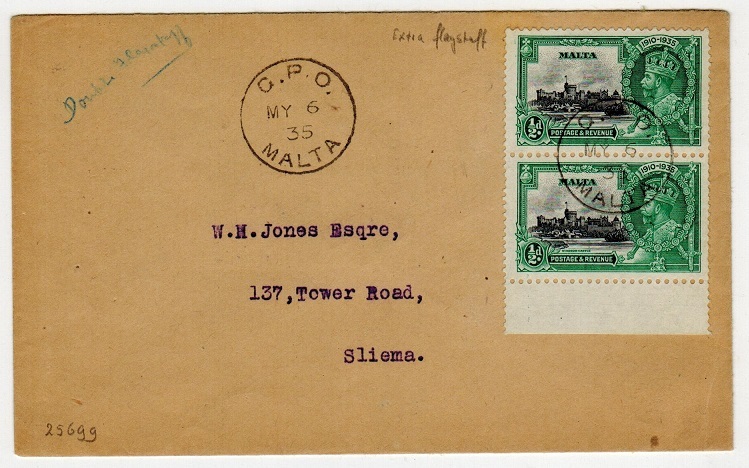 cover addressed to UK bearing 1/2d and 1d pair tied VALLETTA/MALTA with black on white OPENED BY/EXAMINER DD/28 label at left (Little type 8b) tied on reverse by circular '10' mark in greenish blue. MALTA - 1873 6d grey (plate 12) adhesive of GB cancelled by 'A 25' duplex of Malta. SG Z63. 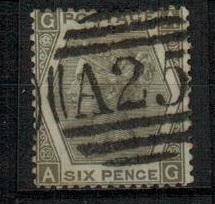 1873 6d grey (plate 12) adhesive of GB cancelled by 'A 25' duplex of Malta. SG Z63. MALTA - 1862 1/- green (no plate) adhesive of GB cancelled by ' A 25' duplex of GB. SG Z76. 1862 1/- green (no plate) adhesive of GB cancelled by ' A 25' duplex of GB. SG Z76. 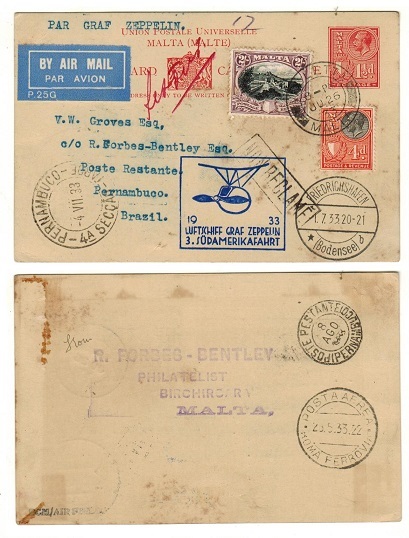 MALTA - 1927 1 1/2d red PSC sent on 3rd Zeppelin flight to Brazil. 1927 1 1/2d red on cream postal stationery postcard (H&G 14) addressed to Brazil bearing additional 4d and 2/- adhesives tied VALLETTA/MALTA and dated JU.26.33. Marked 'Par Graf Zeppelin' and with blue boxed '1933/LUFTSCHIFF GRAF ZEPPELIN/3 SUDAMERIKAFAHRT' cachet applied. FRIEDRICHSHAFEN transit and PERNAMBUCO arrival strikes on the front but struck NON RECLAME in black and returned. A scarce philatelic flown Zeppelin card. MALTA - 1927 1/2d rate cover to Greece with 'SPEND YOUR WEALTH' slogan strike used at VALLETTA. 1927 (FEB.20.) 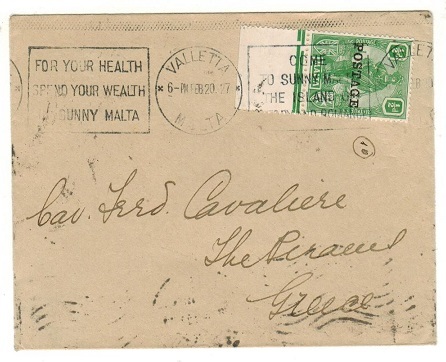 'Printed Paper Rate' cover addressed to Greece bearing 1/2d green overprinted 'Postage' cancelled by FOR YOUR HEALTH/SPEND YOUR WEALTH/IN SUNNY MALTA slogan strike from Valletta. Proud type M1 state 2. MALTA - 1938 1 1/2d rate cover to UK with 'THE IDEAL PLACE FOR RETIREMENT' slogan strike. 1938 (APR.18.) cover addressed to UK bearing 1 1/2d adhesive tied by MALTA/THE IDEAL PLACE FOR RETIREMENT slogan strike from Valletta. Proud type M1 state 4. MALTA - 1945 3d rate censor cover to USA with 'GEORGE CROSS ISLAND' patriotic label applied. 1945 cover addressed to USA bearing 3d blue adhesive tied by COSPICUA/MALTA cds with a light strike of the boxed PASSED/CENSOR h/s at left (Little type 6) with a copy of the rare patriotic imperforated MALTA/THE GEORGE CROSS ISLAND 'Union Jack' flag label. 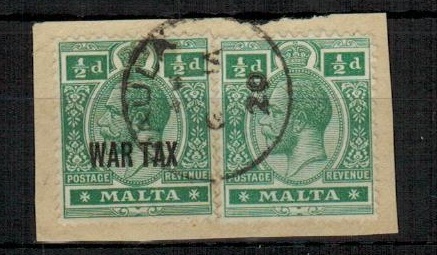 MALTA - 1920 1/2d and 1/2d 'War Tax' on piece tied PAULA. 1920 (JA.6.) use of 1/2d green adhesive tied in combination with 1/2d 'War Tax' stamp on piece by PAULA cds. MALTA - 1915 1d scarlet (SG 73a) cancelled ZEITUN. 1915 1d scarlet cancelled by near complete s/r ZEITUN cds dated AU.8.16. Proud type D1. A scarce strike. SG 73a. MALTA - 1905 2d (SG 50) cancelled ZABBAR. 1905 2d purple and grey adhesive cancelled by s/r ZABBAR cds dated 3.DE.06. Proud type D1. A scarce strike especially on this 2d issue. SG 50. MALTA - 1925 local philatelic cover with 2d 'Postage Due' TETE BECHE pair. 1925 (AP.17.) cover addressed philatelically in pencil bearing a TETE BECHE pair of the 2d 'Postage Due' (SG D4a) tied by VALLETTA/MALTA cds's. A scarce format on cover. 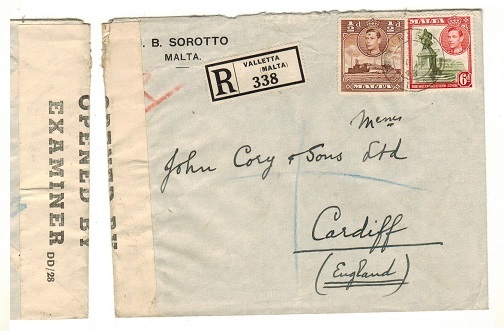 MALTA - 1933 underpaid cover to Italy with 1L 'Postage Due' added on arrival. 1933 (AP.28.) 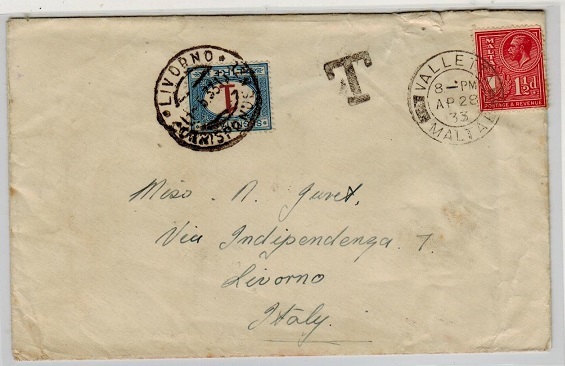 underpaid cover addressed to Italy bearing 1 1/2d adhesive tied by VALLETTA/ MALTA cds with 'T' tax mark at left and with Italian 1L blue and red 'Postage Due' applied on arrival tied LIVORNO/CORRISPONDESNZE. MALTA - 1947 5d rate cover to USA struck PAR AVION JUSQU'A LONDRES. 1947 (SP.27.) 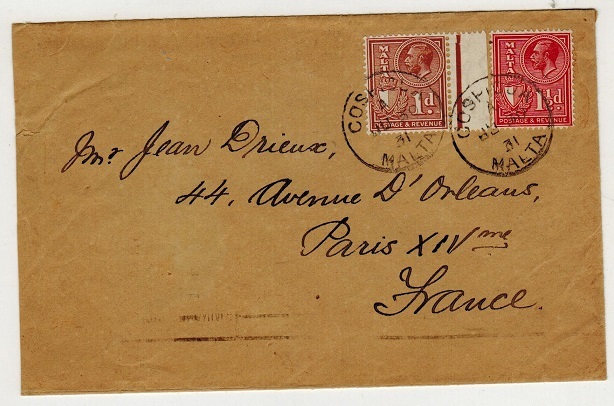 cover addressed to USA bearing 2d and 3d adhesives tied BIRKIRKARA/MALTA cds and stuck at left by scarce PAR AVION JUSQU'A/LONDRES handstamp applied in red. Proud type AM17. Limited use. 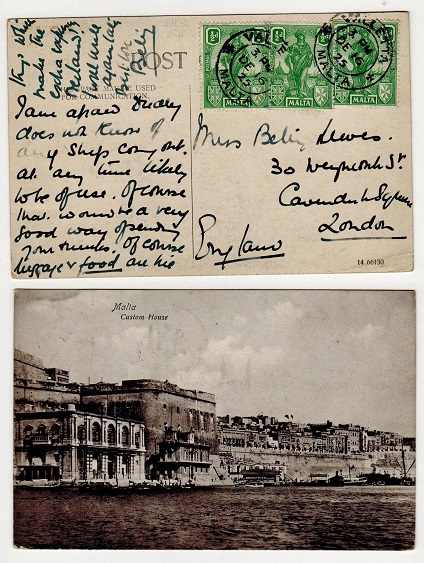 MALTA - 1919 'RECEIVED FROM H.M.SHIP' use of stampless postcard to UK. 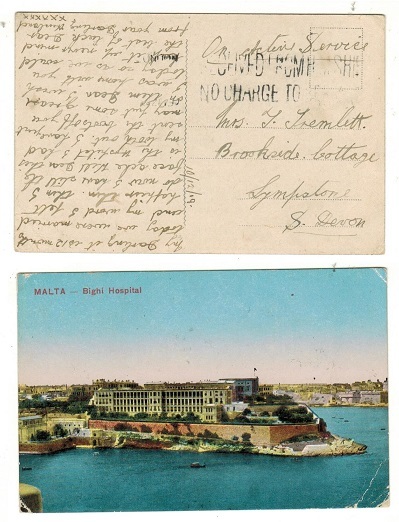 1919 (circa) use of stampless picture postcard addressed to UK depicting 'Biighi Hospital-Malta' struck by black two lined RECEIVED FROM H.M.SHIP/NO CHARGE TO BE RAISED. 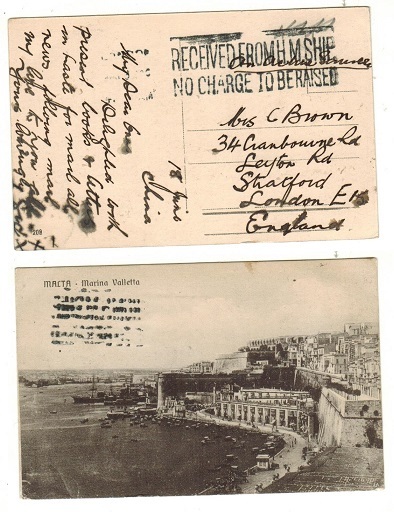 1919 (circa) use of stampless picture postcard addressed to UK depicting 'Marina-Valletta Malta' struck by black two lined RECEIVED FROM H.M.SHIP/NO CHARGE TO BE RAISED. MALTA - 1919 stampless 'O.A.S.' postcard use to UK. 1919 (16.12.) stampless use of picture postcard addressed to UK depicting 'St Angelo and Isola Point-Malta' marked 'On Active Service' in manuscript. 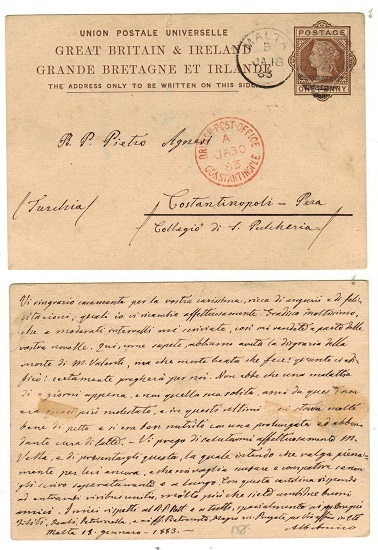 MALTA - 1912 2d blue RPSE to Italy uprated with 4d adhesive. 1912 2d blue on cream registered postal stationery envelope (size H) addressed to Italy bearing additional 4d black adhesive tied by GEORGE CROSS circular cancel and with oval REGISTERED/MALTA cancel alongside dated 26.MR.20. Some minor creases. H&G 4a. MALTA - 1858 3d rate outer wrapper to Italy cancelled by grilled 'M' duplex's. 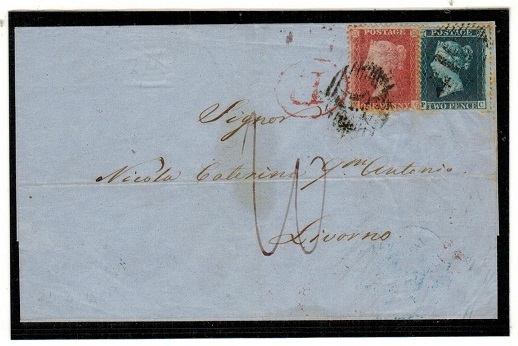 1858 outer wrapper addressed to Italy bearing 'GB' 1d red (no plate) and 2d blue (lines) adhesive tied by grilled 'M' duplex in black (Proud type D2) with red oval 'P' (paid) h/s at left. Red MALTA s/r b/s. 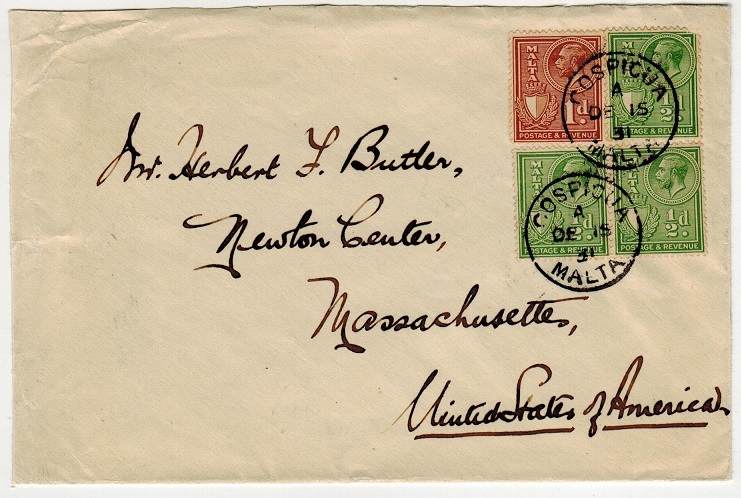 MALTA - 1934 4 1/2d rate cover to Italy cancelled by violet AIR MAIL/MALTA cancels. 1934 (AP.24.) 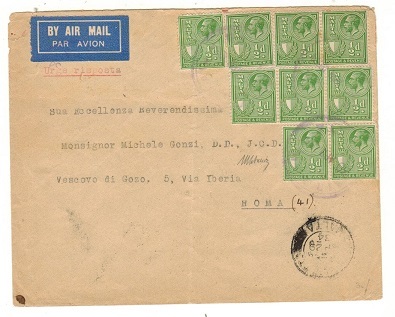 cover addressed to Italy (central fold) bearing nine examples of the 1/2d green 'Postage and Revenue' adhesive tied by violet AIR MAIL/MALTA cancels (Proud type AM1). 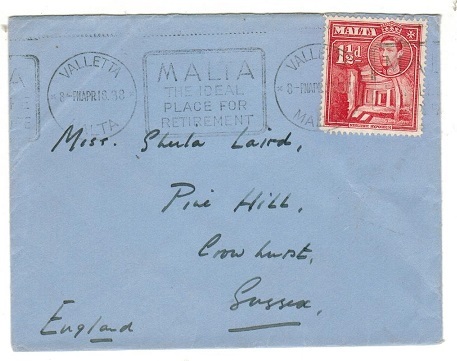 MALTA - 1944 1/3d rate 'POSTAL CENSOR' cover to UK cancelled AIR MAIL/MALTA. 1944 (SP.21.) 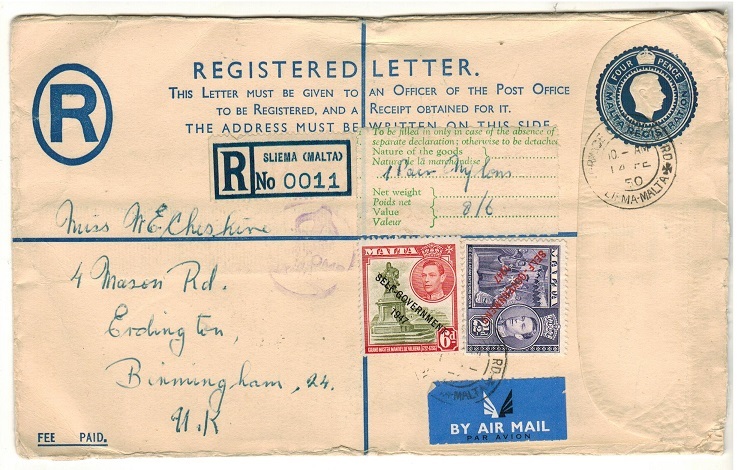 commercial cover addressed to UK bearing 3d and 1/- adhesives tied by AIR MALTA cds and struck at lower left by oval POSTAL CENSOR h/s in blue. Little type 2. 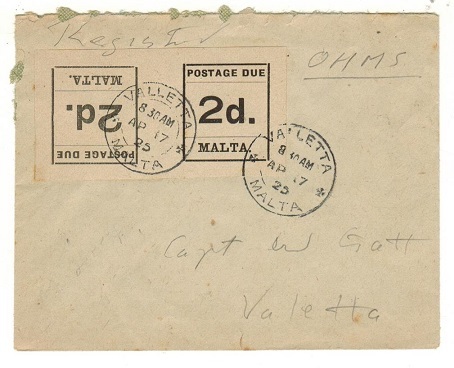 MALTA - 1944 2 1/2d rate censor cover to UK used at VALLETTA. 1944 (NO.6.) 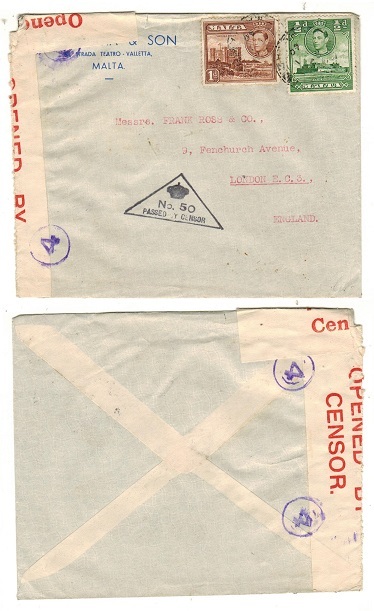 cover addressed to UK bearing 2 1/2d adhesive tied by VALLETTA cds with black on white OPENED BY/EXAMINER DD/28 censor label at left (Little type 8B) tied on the reverse side by greenish circular '10' censor mark. Little type 3a. MALTA - 1947 use of 'Cable and Wireless' telegram form. 1947 (APR.15.) use of red on cream 'CABLE AND WIRELESS' telegram form cancelled by MALTA/ST.GEORGES SLIEMA cds. 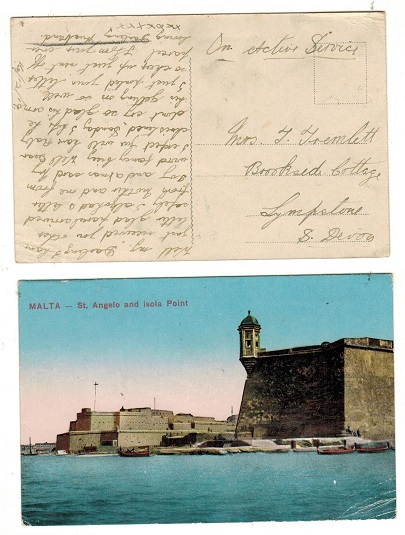 MALTA - 1913 inward postcard from UK struck 'TENDERED ON RECEIPT/REFUSED TO PAY' h/s. 1913 (OCT.21.) inward underpaid postcard from UK with MALTA s/r cds applied on arrival and SLILMA B.O. cds. Circular '1d' tax mark applied and the very rare black boxed TENDERED ON RECEIPT, TO POST OFFICE/WHO REFUSED TO PAY CHARGE instructional handstamp. Proud type I31. MALTA - 1960 'EXPRESS FEE PAID' registered cover to UK. 1960 (MY.15.) 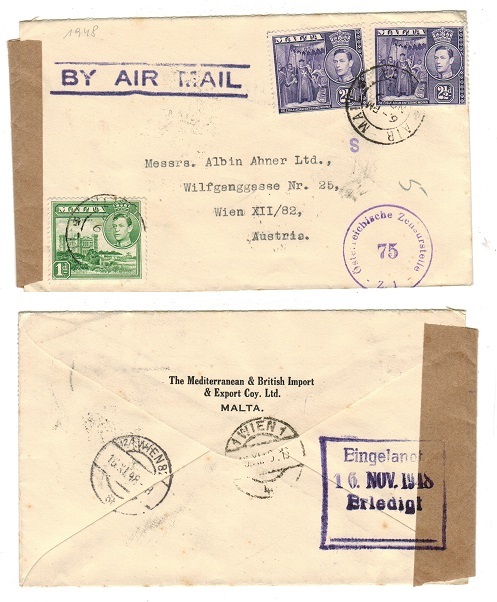 large sized registered cover to UK bearing 1/2d (x2) and 1 1/2d (x2,6d and 1/- 'St.Pauls' Centenary adhesives cancelled by the special CENTENARY ST PAUL SHIP WRECK/MALTA cancels and with LUQA AIRPORT/MALTA cds at left. Struck by black boxed EXPRESS FEE PAID handstamp with dull red on white POST OFFICE/EXPRESS/DELIVERY label at left. MALTA - 1940 1 1/2d rate censor cover to UK. 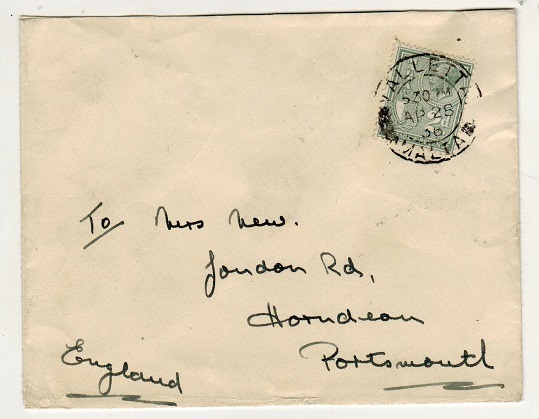 1940 cover addressed to UK bearing 1/2d and 1d adhesives with orange on cream OPENED BY/ CENSOR label at left tied on the front and reverse by circular '4' censor handstamps in violet and with black crowned triangular No.50/PASSED BY CENSOR h/s applied on front. Unrecorded in black ink. 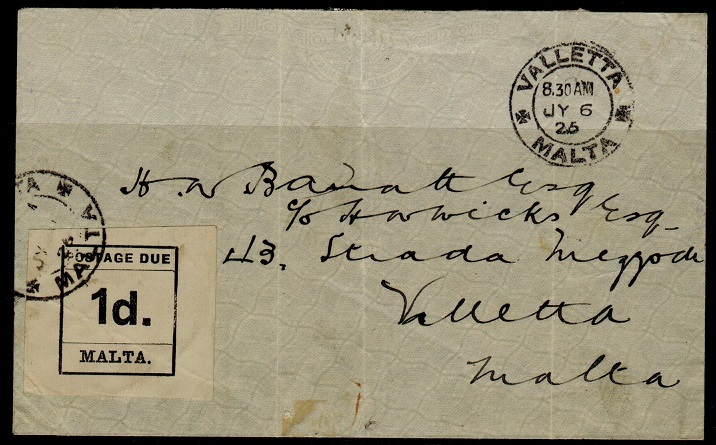 MALTA - 1934 2 1/2d rate local cover cancelled by 'A & V VON BROCKDORPP' commercial cancel. 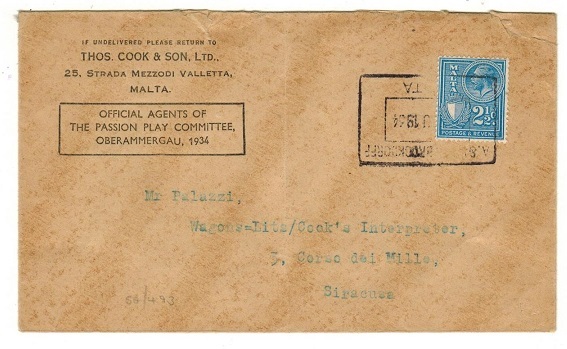 1934 'Thos Cook & Sons' cover addressed locally to Siracusa bearing 2 1/2d adhesive tied by squared 'A & V Von Brockdorpp/Malta' commercial dated cancel. Overall toned and with central fold. Unusual commercial use of this cancel on domestic mail however from this travel company established in Malta in 1913. MALTA - 1917 (circa) 'RECEIVED FROM HMS SHIP/NO CHARGE TO BE RAISED' postcard use to UK. 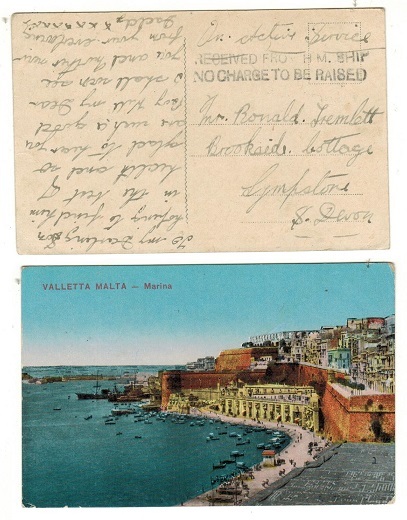 1917 (circa) use of stampless postcard addressed to UK depicting 'Malta-Marina Valletta' cancelled by two lined RECEIVED FROM H.M.SHIP/NO CHARGE TO BE RAISED h/s. MALTA - 1916 'OAS' postcard use to UK with ON ACTIVE SERVICE 'cross' h/s applied. 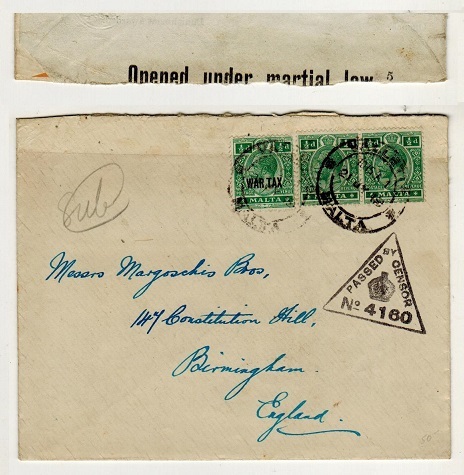 1916 use of stampless postcard marked 'On Active Service' and canncelled by ARMY POST OFFICE cds with black ON ACTIVE SERVICE 'cross' h/s applied. MALTA - 1947 (NO.27.) use of 'MALTA PARCEL POST SERVICE' certificate of posting. 1947 (NO.27.) use of 'MALTA PARCEL POST SERVICE' certificate of posting cancelled by blotchy postmark. 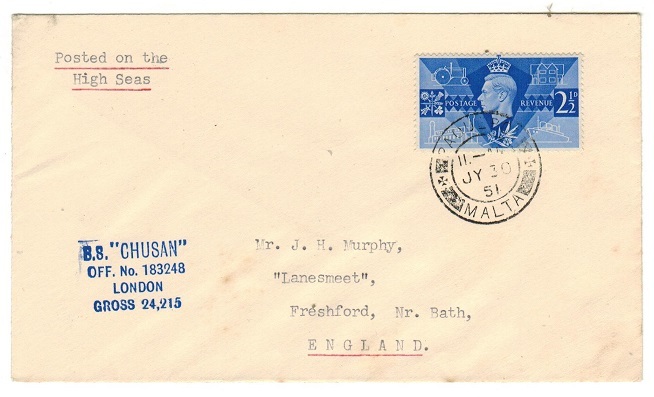 MALTA - 1951 'S.S.CHUSAN' maritime cover to UK. 1951 (JY.30.) 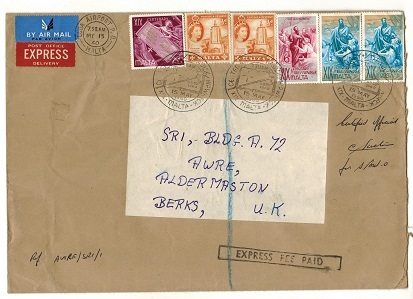 cover addressed to UK bearing GB 2 1/2d adhesive tied by PAQUEBOT/MALTA cds and struck at left by S.S.CHUSAN maritime handstamp. MALTA - 1946 local 'Victory' cover with rare MALTA/THE GEORGE CROSS ISLAND label tied. 1946 (DEC.8.) 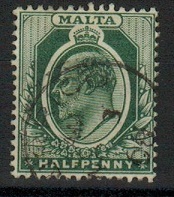 cover addressed locally bearing the 'Victory' adhesive pair tied by Maltese Cross VALLETTA roller strike (affected by some light tone staining) but bearing a copy of the rare MALTA/THE GEORGE CROSS ISLAND patriotic label which has been tied at left. 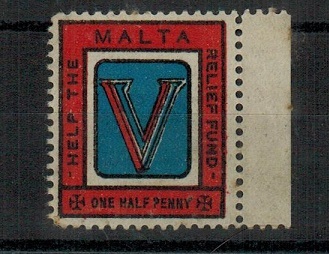 MALTA - 1941 1/2d/MALTA/HELP THE RELIEF FUND label in a mint block of four. 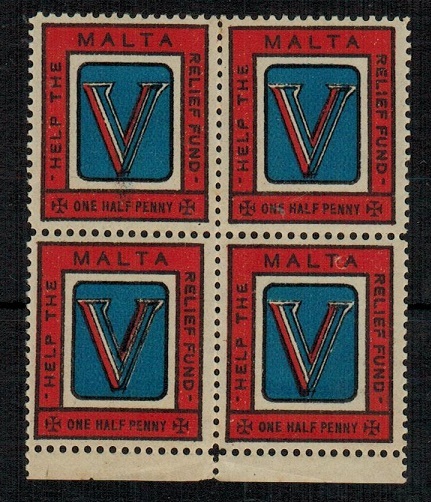 1941 1/2d red, white and blue MALTA/HELP THE RELIEF FUND patriotic label in a fine mint bottom marginal block of four. A scarce multiple. 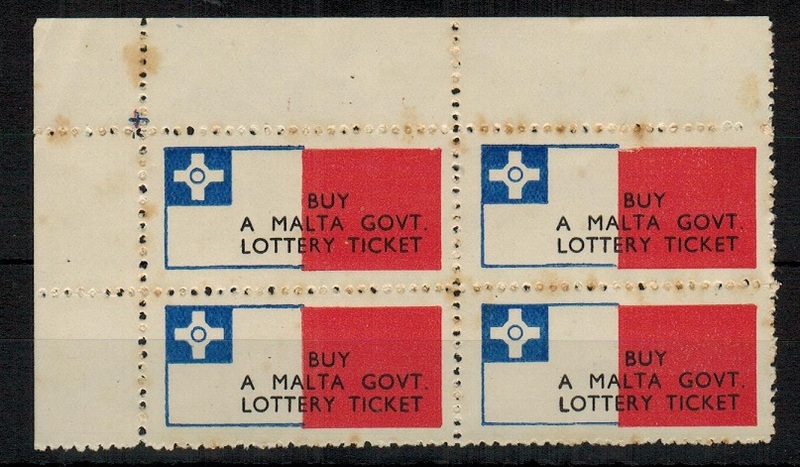 MALTA - 1948 BUY/MALTA GOV.T/LOTTERY TICKET label in a unused block of four. 1948 red, white and blue BUY/A MALTA GOV.T/LOTTERY TICKET perforated corner marginal block of four without gum (as issued). The block is affected by some tone staining but this label is not easy in multiples. MALTA - 1949 1d 'Silver Wedding' local FDC with LOTTERY ticket label applied. 1949 (JA.4.) 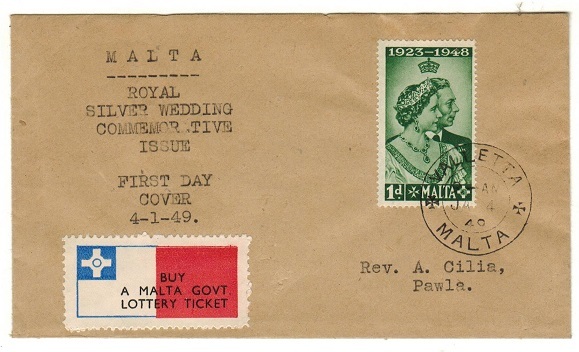 1d green 'Silver Wedding' first day cover addressed locally and cancelled by VALLETTA/MALTA cds with red, white and blue BUY/A MALTA GOVT./LOTTERY TICKET label at lower left. MALTA - 1948 2 1/2d rate cover to UK used at PRINCE OF WALES RD with LOTTERY ticket label applied. 1948 (NO.5.) 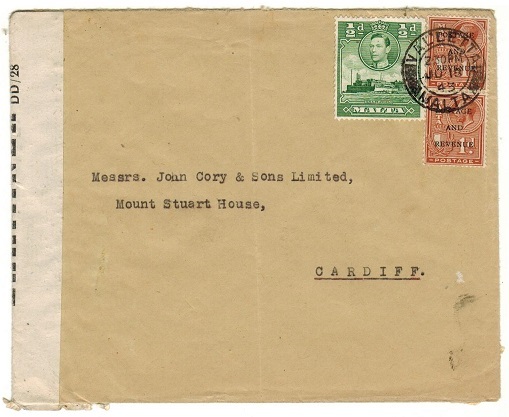 cover addressed to UK (roughly opened on reverse) bearing 2 1/2d violet adhesive tied by PRINCE OF WALES RD cds and with red, white and blue BUY/A MALTA GOVT./LOTTERY TICKET label at lower left. 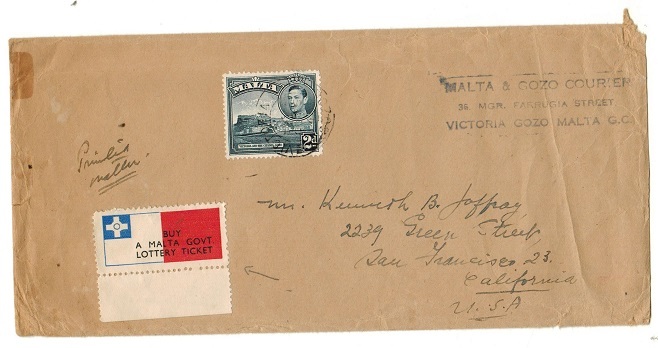 MALTA - 1948 2d surface mail cover to USA from VICTORIA/GOZO with LOTTERY ticket label applied. 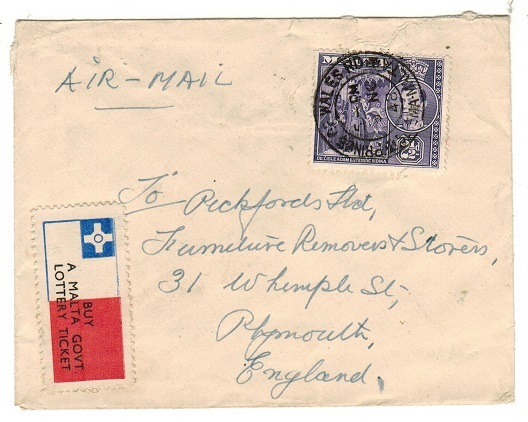 1948 longer manila cover addressed to USA (faults) bearing 2d adhesive tied VICTORIA/GOZO cds and with red, white and blue BUY/A MALTA GOVT./LOTTERY TICKET label at lower left. MALTA - 1971 3/- SPECIAL COURIER MAIL/UK TO MALTA label on cto'd cover. 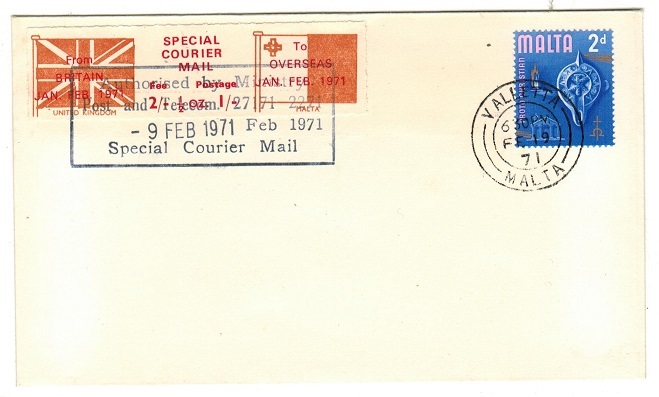 1971 unaddressed 'cto' cover bearing an example of the red and orange on white 'rouletted' 3/- SPECIAL COURIER MAIL/UK to MALTA label cancelled AUTHORISED BY MINISTRY OF POSTS AND TELECOM dated 9.FEB.71 with the addition of a Malta 2d on arrival tied VALLETTA/MALTA. Devised to carry mail from the UK to Malta during the Post Office strike in England in Jan/Feb 1971. 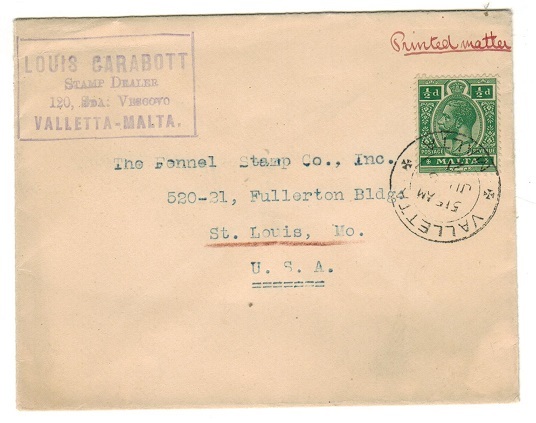 MALTA - 1921 1/2d rate cover to USA used at VALLETTA. 1921 (JU.5.) commercial cover to USA bearing 1/2d green tied VALLETTA/MALTA and marked as 'Printed Matter'. A nice 1/2d rate use. MALTA - 1927 1/2d rate cover to USA used at VALLETTA. 1927 (MY.7.) 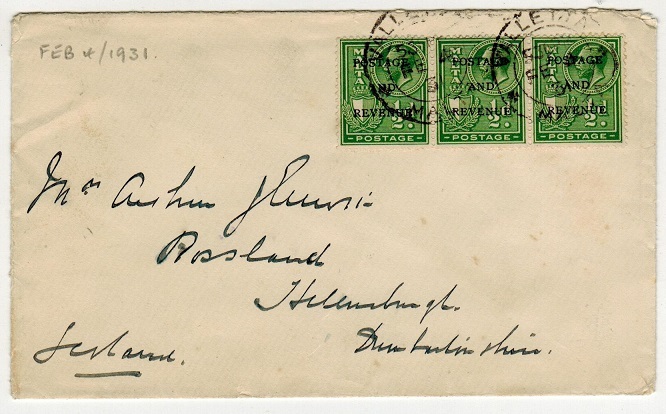 cover addressed to USA bearing 1/2d green (SG 158) with a 'pillar' bottom margin tied by VALLETTA/MALTA cds. A nice 'Printed Paper' rate franking. 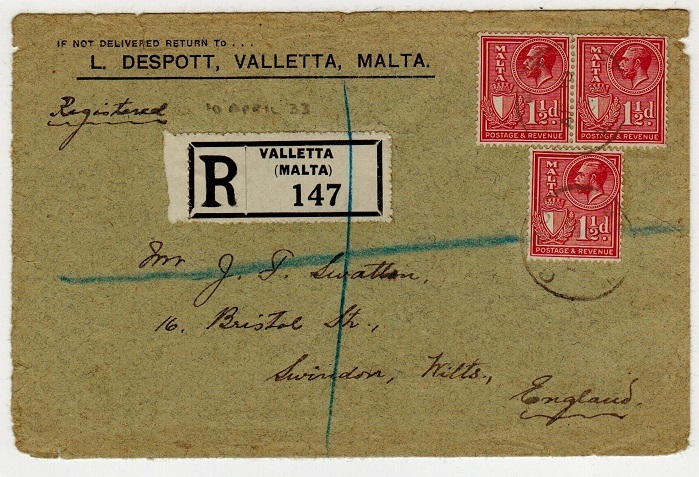 MALTA - 1936 2d rate cover to UK used at VALLETTA. 1936 (AP.28.) 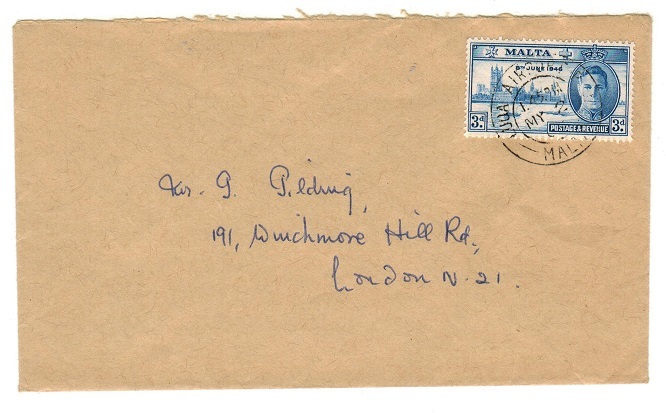 cover addressed to UK bearing 2d grey (SG 197) tied by VALLETTA/MALTA cds. 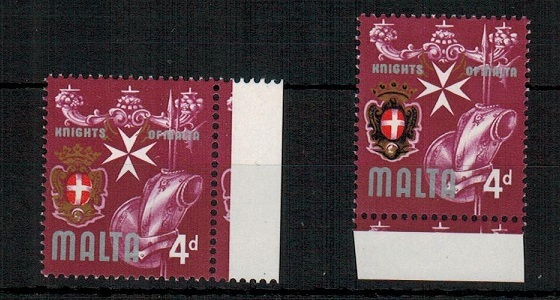 MALTA - 1965 4d 'Knights Of Malta' unmounted mint with BLACK OMITTED. SG 336c. 1965 4d 'Knights of Malta' adhesive in a fine unmounted mint right hand marginal example showing the variety BLACK OMITTED. SG 336c. 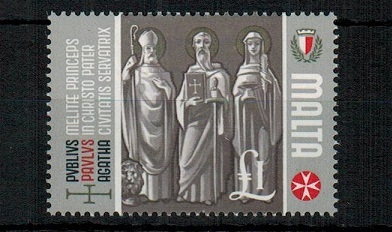 MALTA - 1965 £1 'Patron Saints' unmounted mint with PINK OMITTED. SG 348a. 1965 £1 'Patron Saints' adhesive in fine unmounted mint condition showing the major error PINK OMITTED. SG 348a. MALTA - 1938 4d blue RPSE to UK uprated at SLIEMA. H&G 8a. 1938 4d blue on cream registered postal stationery envelope (size H) addressed to UK bearing additional 2 1/2d and 6d 'Self Government' overprint adhesives tied by PRINCE OF WALES RD/ SLIEMA MALTA cds's dated 14.FE.50. H&G 8a. 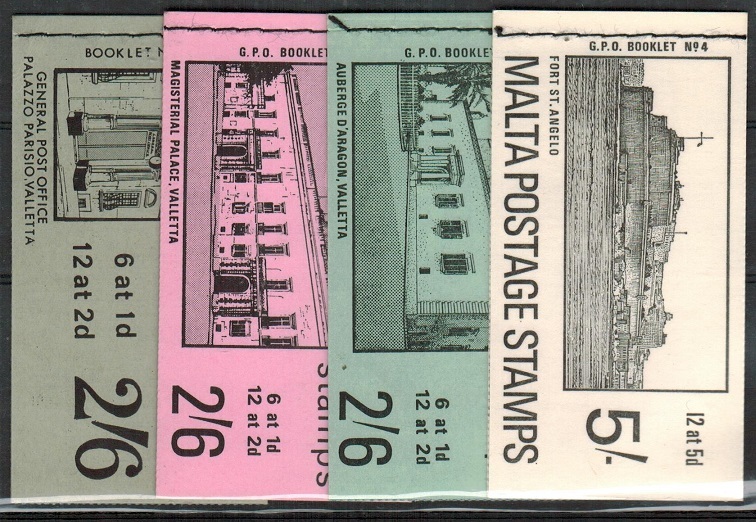 MALTA - 1970-1971 2/6d and 5/- BOOKLETS No.1-4. SG SB1-4. 1970-1971 2/6d and 5/- BOOKLETS No.1-4 all stiched at left. SG SB1-4. 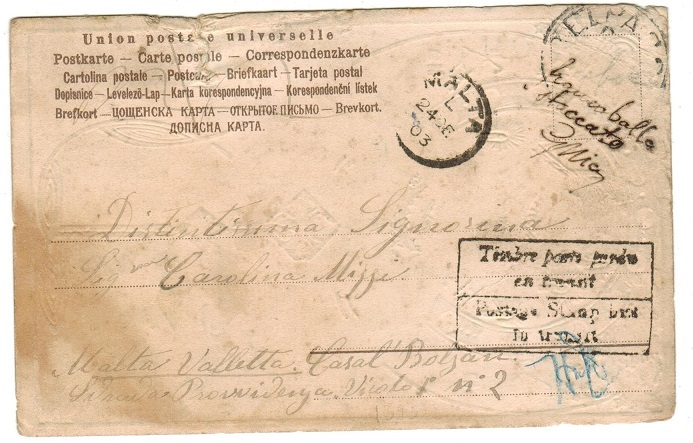 MALTA - 1913 2d blue uprated RPSE to Finland. H&G 5a. 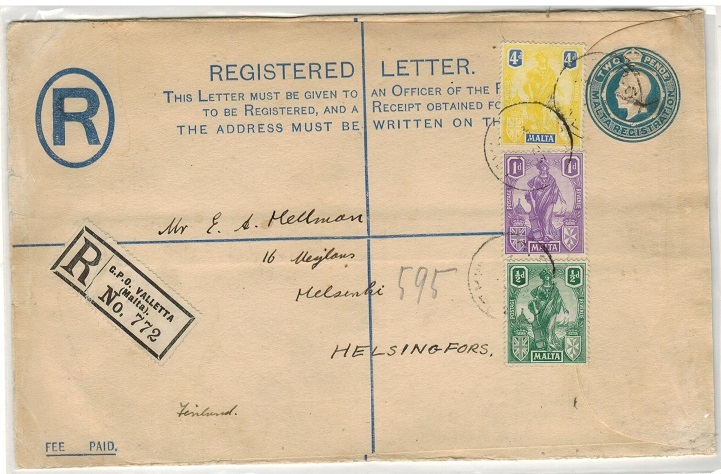 1913 2d blue on cream registered postal stationery envelope (size H) with 'Fee Paid' at bottom left addressed to Finland (scarce) and bearing additional 1/2d,1d and 4d adhesives tied by GPO/MALTA cds's dated in 1924. H&G 5a. 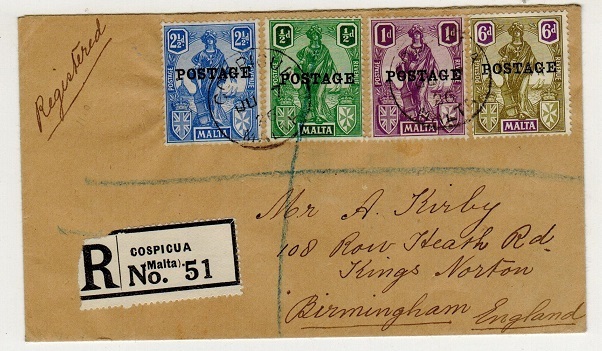 MALTA - 1936 multi franked registered cover to UK used at COSPICUA. 1936 (JU.7.) registered cover to UK bearing 1/4d, 1d, 1 1/2d and 3d 'Postage' overprinted adhesives tied COSPICUA and with black on white perforated R/COSPICUA/(MALTA)/No. registered label below. 1936 (JU.7.) registered cover to UK bearing 1/2d, 1d, 2 1/2d and 6d 'Postage' overprinted adhesives tied COSPICUA and with black on white perforated R/COSPICUA/(MALTA)/No. registered label below. MALTA - 1931 2 1/2d rate cover to France used at COSPICUA. 1931 (JU.30.) 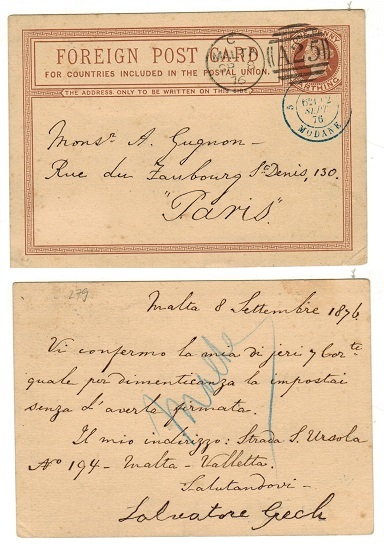 cover addressed to France bearing 1d and 1 1/2d adhesives tied by COSPICUA/ MALTA cds. 1931 (SP.26.) 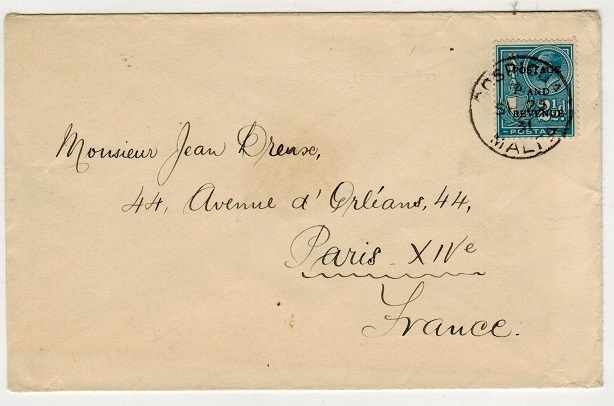 cover addressed to France bearing 2 1/2d 'Postage and Revenue' overprinted adhesive (SG 181) tied by COSPICUA/MALTA cds. MALTA - 1908 1d rate postcard use to Ireland used at MIGIARRO B.O./GOZO. 1908 (DE.23.) 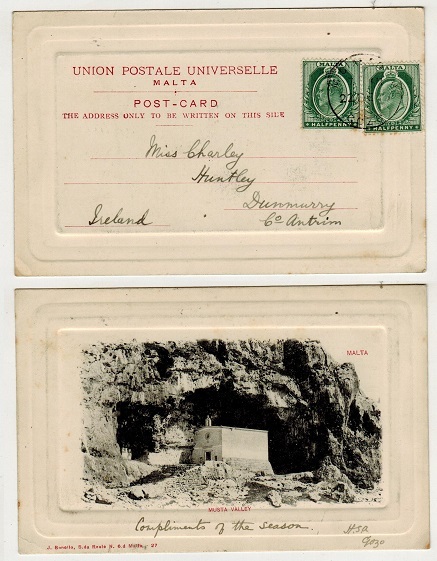 use of picture postcard addressed to Ireland depicting 'Musta Valley' and bearing 1/2d pair tied by light MIGIARRO B.O./GOZO cds (Proud type D2). MALTA - 1919 1d rate + 1/2d 'War Tax' cover to UK used at VALLETTA. 1919 (FE.6.) cover addressed to UK bearing 1d adhesive tied alongside the 1/2d green 'War Tax' issue (SG 92) tied VALLETTA/MALTA. MALTA - 1875 1/4d brown 'GB' PSC used to France. H&G 4. 1875 1 1/4d brown on cream postal stationery 'Foreign Postcard' of GB addressed to France and cancelled by 'A 25' duplex with MALTA cds alongside dated SP.6.76. A scarce use of this postcard in Malta. H&G 4. MALTA - 1883 1d brown 'GB' PSC used to Constantinople. H&G 10. 1883 1d brown on cream 'UPU-Great Britain & Ireland' postal stationery postcard of GB addressed to Constantinople and cancelled by 'A 25' duplex with MALTA cds alongside dated JA.18.83. 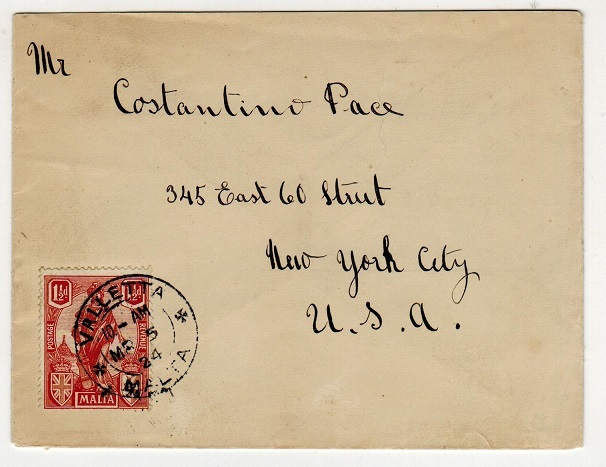 Red BPO/CONSTANTINOPLE arrival cds on front dated JA.30.83. H&G 10. MALTA - 1941 1/2d HELP THE MALTA RELIEF FUND patriotic label mint. 1941 1/2d red white & blue HELP THE MALTA RELIEF FUND-V FOR VICTORY label in superb fresh mint condition with full original gum. MALTA - 1942 special CHRISTMAS 1942/MALTA/LETTER CARD in red. Fine unused. 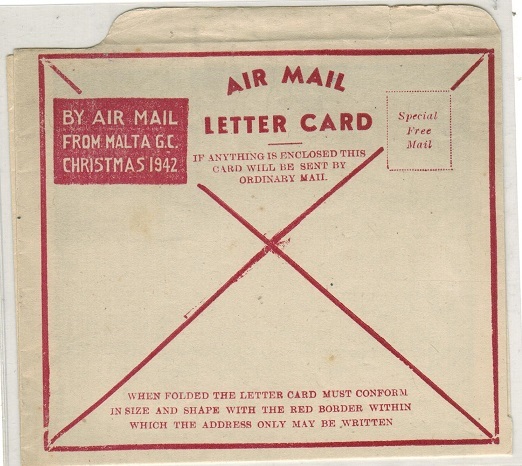 1942 special red on cream BY AIR MAIL/FROM MALTA G.C./CHRISTMAS 1942 'Air Letter/ Letter Card' in fine unused condition. 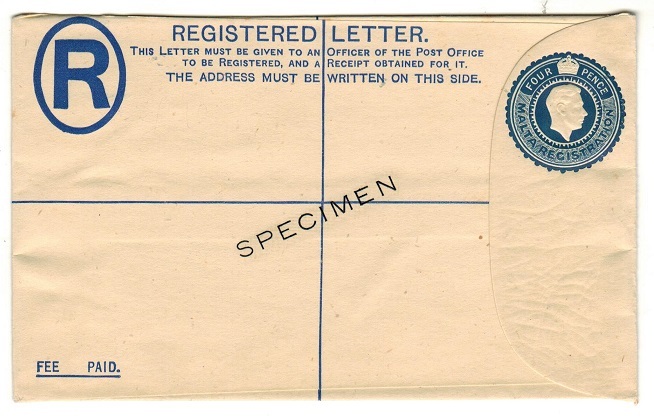 Issued to troops for free mail. Elusive item. RL type XAL-R.
MALTA - 1900 1d deep rose PSE unused. H&G 1c. 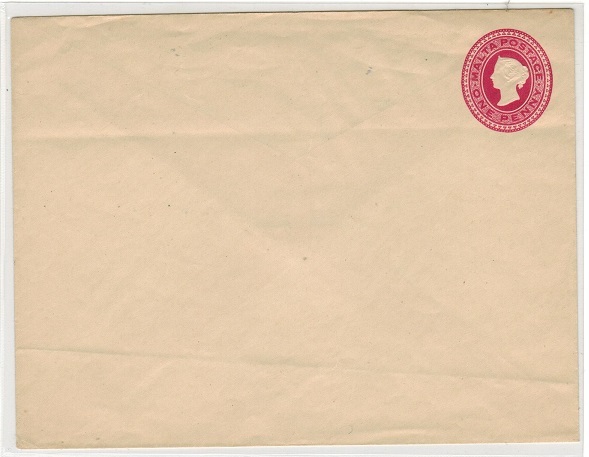 1900 1d deep rose on thin cream woved paper postal stationery envelope (size 158x123mm). A scarcer size to find. H&G 1c. MALTA - 1942 2d dark red PSC unused. H&G 19. 1942 2d dark red on cream 'KGVI' postal stationery postcard in fine unused condition. H&G 19. MALTA - 1939 'Ala Littoria' first flight cover to Malta. 1939 (JU.5.) 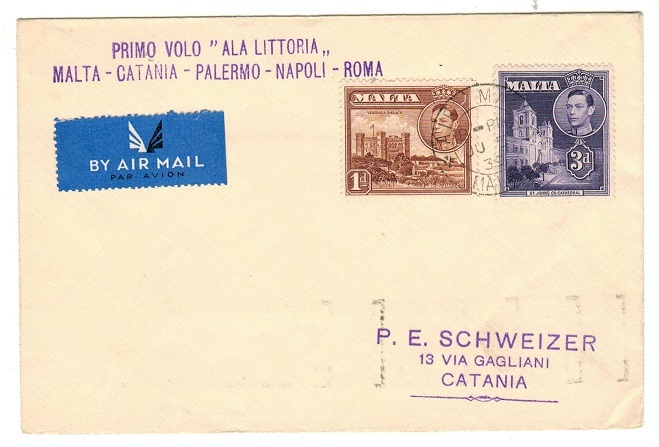 first flight cover addressed to Italy bearing 1d and 3d adhesives tied by AIR MAIL/ MALTA cds and struck at top by violet two lined PRIMO VOLO ALA LITTORIA/MALTA-CATANIA- PALERMO-NAPOLI-ROMA. Very scarce with only 44 covers flown. MALTA - 1938 4d blue RPSE (size G) SPECIMEN. H&G 8. 1938 4d blue on cream registered postal stationery envelope (size G) in unused condition with SPECIMEN applied diagonally in black. H&G 8. MALTA - 1960 (circa) cover to UK used at LUQA AIRPORT. 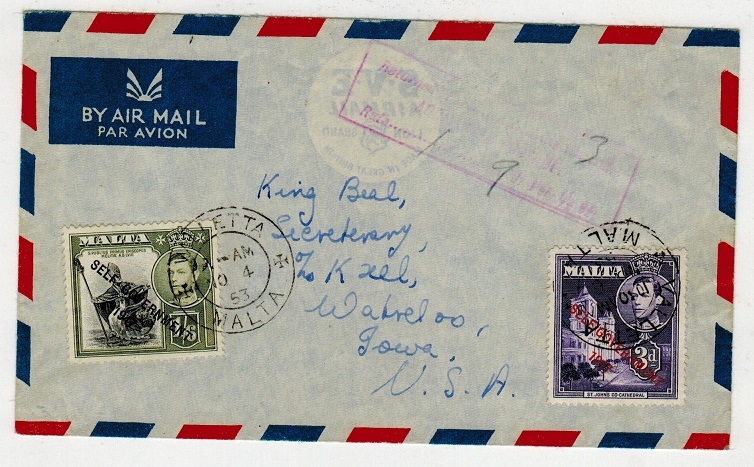 1960 (circa) cover addressed to UK bearing 'KGVI' 3d victory adhesive tied by LUQA AIRPORT/ MALTA cds dated May 2nd. The year slug not showing. This was the branch Post Office at the civilian air terminal. MALTA - 1928 5 1/2d rate registered cover to Italy using 1/2d adhesives at SLIEMA. 1928 (NO.24. 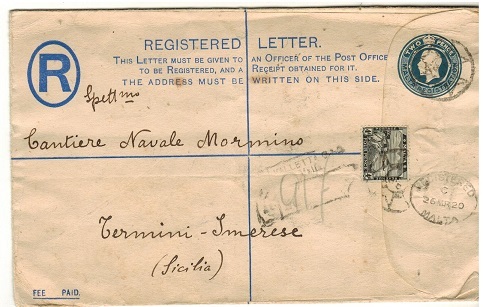 Registered cover addressed to Italy bearing 1/2d green overprinted 'Postage' on front with an additional block of ten on reverse side cancelled by SLIEMA/MALTA cds's with black rubber R/SLIEMA/MALTA/No. registered handstamp at left. 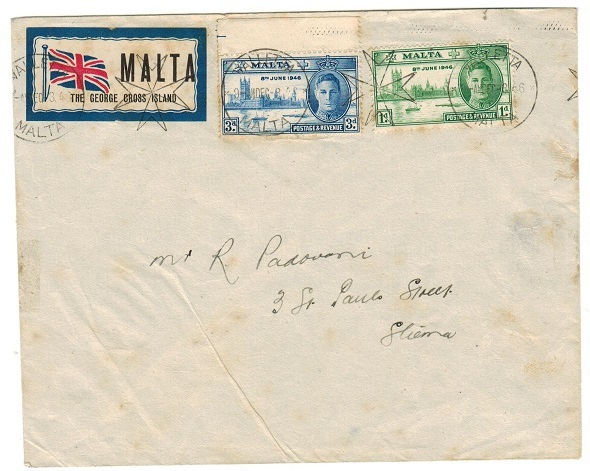 MALTA - 1933 4 1/2d rate registered cover to UK. 1933 (AP.10.) registered commercial cover to UK bearing 1 1/2d rose-red (SG 196) adhesive (x3) tied GPO/MALTA. MALTA - 1931 2 1/2d rate cover to USA used at COSPICUA. 1931 (DE.15.) cover addressed to USA bearing 1/2d (x3) and 1d adhesive (SG 194+195) tied by COSPICUA/MALTA cds's. Opened on two sides. 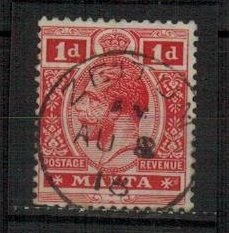 MALTA - 1931 1 1/2d rate cover to UK. 1931 (FE.4.) 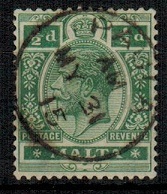 cover addressed to UK bearing 1/2d green (x3) adhesive (SG 175) tied VALLETTA/ MALTA. 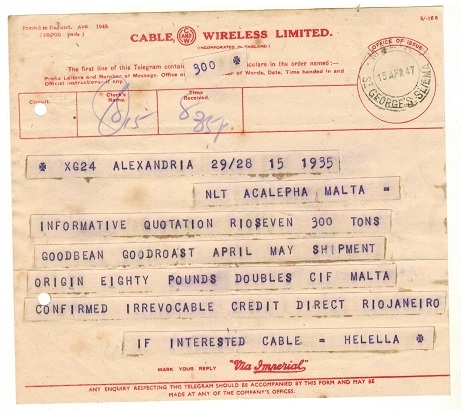 MALTA - 1940 'Cable and Wireless' TELEGRAM envelope registered locally. 1940 (AU.6.) 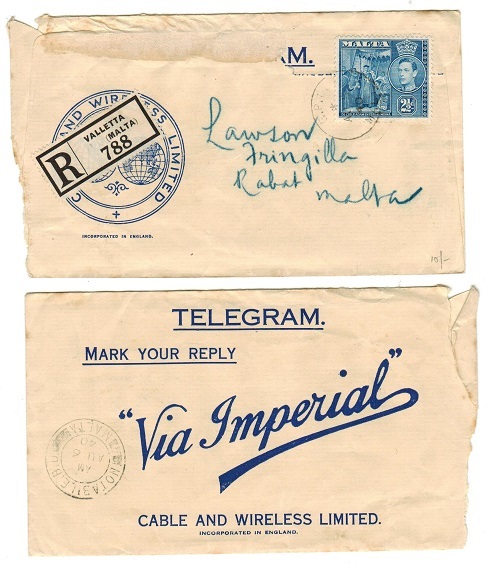 blue on cream 'Cable and Wireless Limited' TELEGRAM envelope registered locally to Rabat bearing 2 1/2d adhesive tied GPO/MALTA with black on white R/VALLETTA/ MALTA registered label at left and with NOTABILE B.O./MALTA transit b/s. 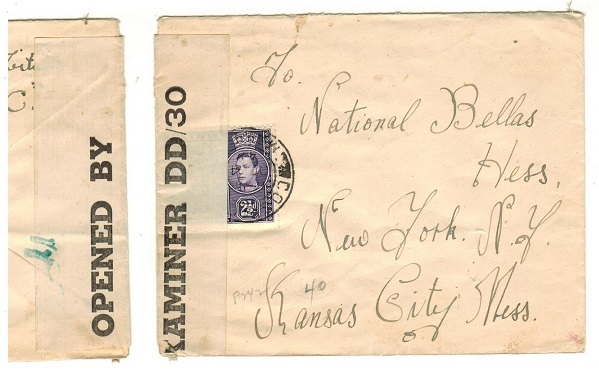 A scarce registered use of a telegram envelope. MALTA - 1924 1 1/2d rate cover to USA. 1924 (MR.5.) 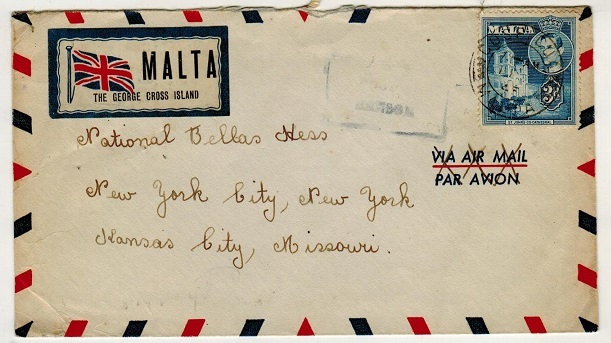 cover addressed to USA bearing 1 1 1/2d red-brown (SG 127) tied VALLETTA/MALTA. MALTA - 1923 postcard use to UK. 1923 (DE.16.) use of picture postcard addressed to UK depicting 'Malta-Cistoms House' bearing 1/2d green (SG 124) adhesive (x3) tied VALLETTA/MALTA. MALTA - 1936 1/2d 'Silver Jubilee' pair on FDC showing EXTRA FLAGSTAFF variety. 1936 (MY.6.) 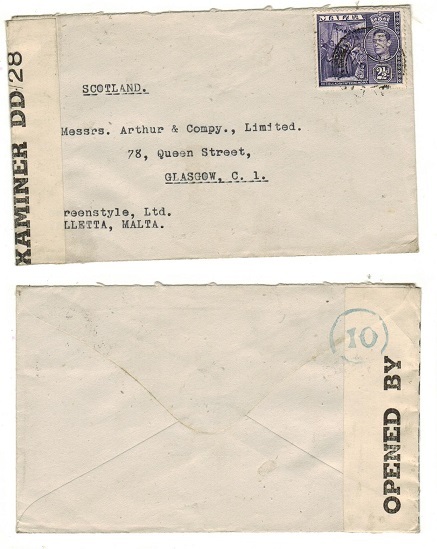 first day cover addressed locally to Sliema bearing a fine vertical marginal pair of the 1/2d 'Silver Jubilee' adhesive with one example showing the EXTRA FLAGSTAFF variety from Row 9/1 (SG 210a) cancelled by central GPO/MALTA cds with a further strike alongside. Rare on cover. MALTA - 1925 stampless local cover (creases) with 1d 'Postage Due' added. 1925 (SP.6.) 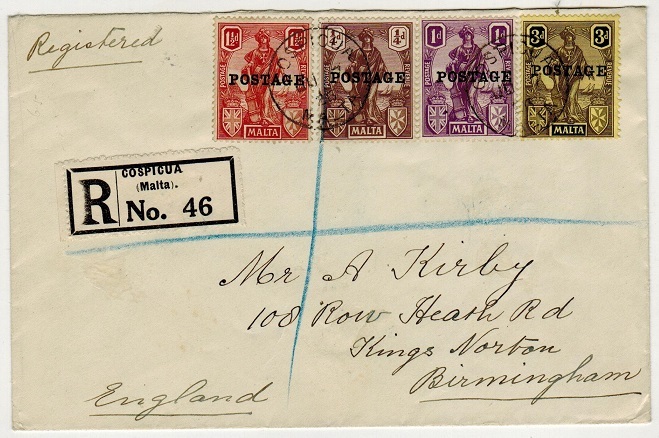 stampless inward cover from UK cancelled BIRMINGHAM/107 with sexagonal 'T' tax mark applied and with Malta 3d blue (SG D16) 'Postage Due' added on arrival and cancelled VALLETTA/MALTA. 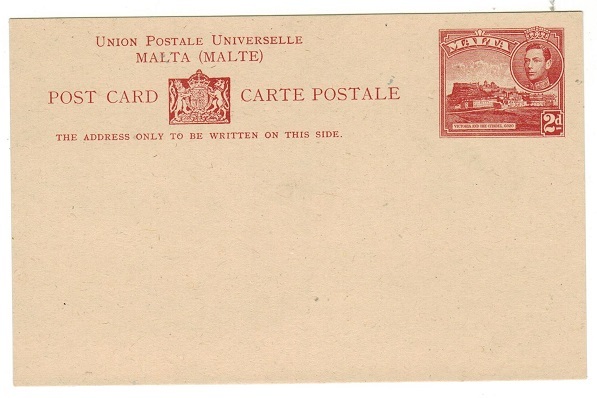 MALTA - 1925 underpaid local cover with 1/2d 'Postage Due' added. 1925 (MY.8.) 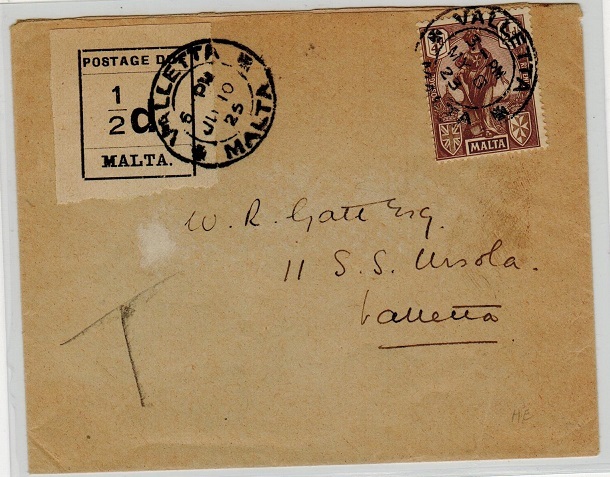 'Gatt' cover addressed locally bearing 1/4d brown (SG 123) tied by VALLETTA/ MALTA cds and being underpaid having pencil 'T' tax mark applied at lower left and with 1/2d black on cream 'Postage Due' added (SG D1) and dated JU.10.25. MALTA - 1885 1/2d green (SG 20) cancelled by central CURMI cds. 1885 1/2d green (SG 20) cancelled by superb central CURMI cds dated SP.16.01. (Proud type D1.) Small toned bottom left corner perf but a very scarce strike. 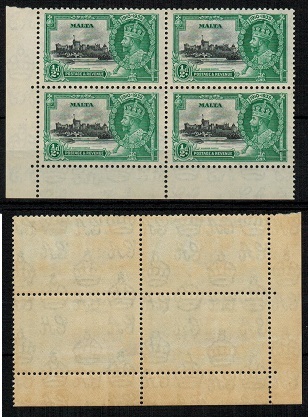 MALTA - 1935 1/2d 'Silver Jubilee' mint (toned gum) block of four with EXTRA FLAGSTAFF. SG 210a. 1935 1/2d black and green 'Silver Jubilee' adhesive in a mint corner marginal block of four (gum lightly toned) showing the EXTRA FLAGSTAFF variety on Row 9/1. SG 210a. 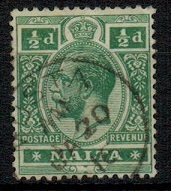 MALTA - 1914 1/2d green cancelled MUSTA. SG 71. 1914 1/2d green (SG 71) cancelled by part MUSTA cds dated JA.20.16. Proud D1. MALTA - 1914 1/2d green cancelled CASAL LIA. SG 71. 1914 1/2d green (SG 71) cancelled by part CASAL LIA cds dated JY.10.17. Proud D1. MALTA - 1914 1/2d green cancelled PAULA. SG 71. 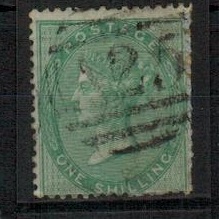 1914 1/2d green (SG 71) cancelled by central PAULA cds dated MY.31.15. Proud D1. MALTA - 1903 1/2d green cancelled ZEBBUG. SG 38. 1903 1/2d green (SG 38) cancelled by part ZEBBUG cds dated in 1904. Proud D1. 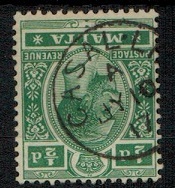 MALTA - 1903 1/2d green cancelled ZURRICO. SG 38. 1903 1/2d green (SG 38) cancelled by part ZURRICO cds dated NO.3.08. Proud D1. 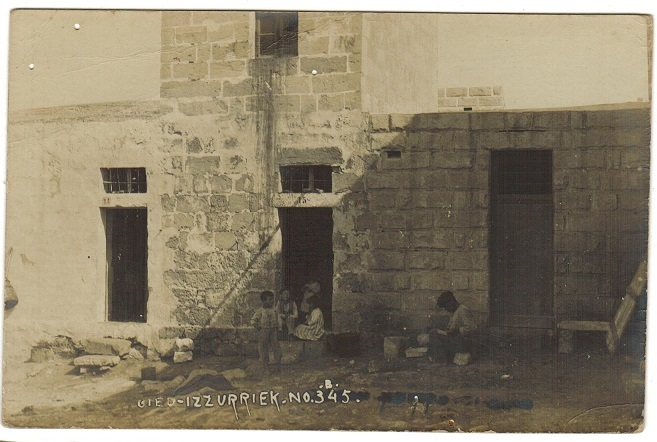 MALTA - 1910 (circa) real photo postcard unused marked 'Gied Iz Zurriek'. 1910 (circa) real unused photo pitcure postcard marked 'Gied-Iz-Zurriek' and depicting a small group of local children outside stone village house. A scarce early postcard. 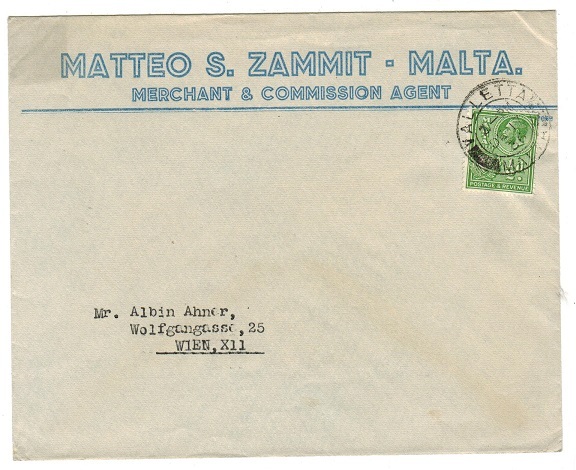 MALTA - 1936 1/2d printed letter rate commercial cover to Austria. 1936 (DE.17.) 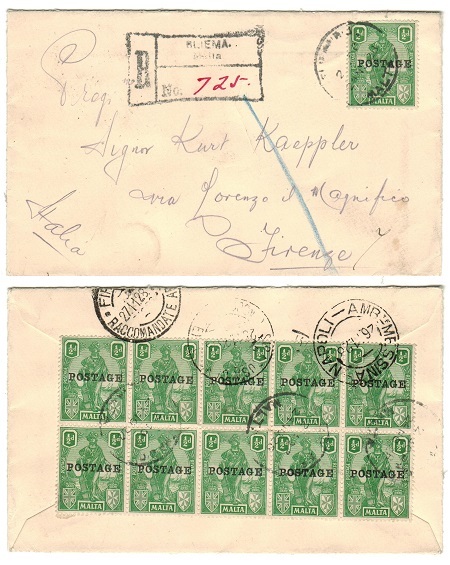 pre-printed commercial cover addressed to Austria at the printed paper rate bearing single 1/2d green adhesive tied VALLETTA/MALTA. MALTA - 1948 cover to Austria with post war censorship. 1948 (NO.9.) 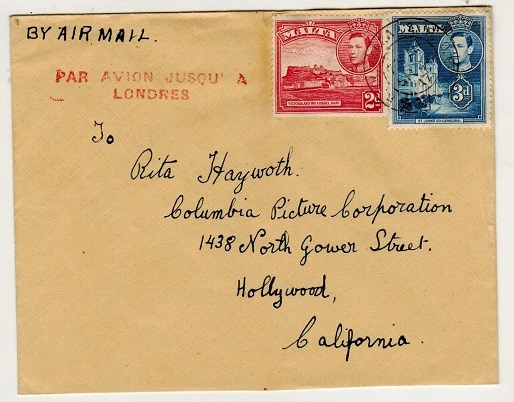 cover addressed to Austria bearing 1d and 2 1/2d adhesive pair tied by AIR MAIL/MALTA cds with violet BY AIR MAIL rubber h/s applied at left. 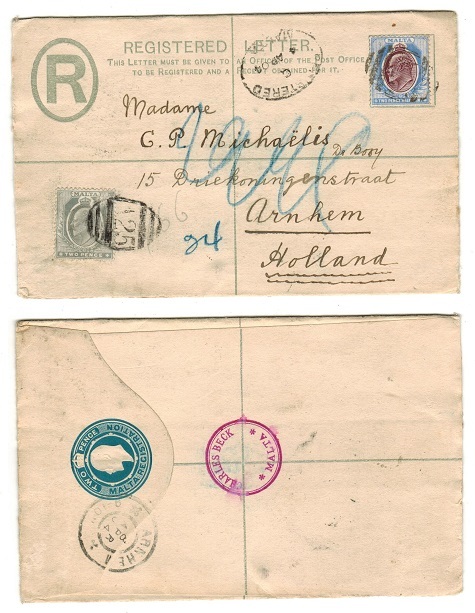 The cover was censored on arrival with violet OSTERIEICHISCHE ZEUSURSTELLE/75/Z1 h/s and with manila strip at left tied on reverse by violet boxed EINGELANOT/ERLEDIGT h/s. 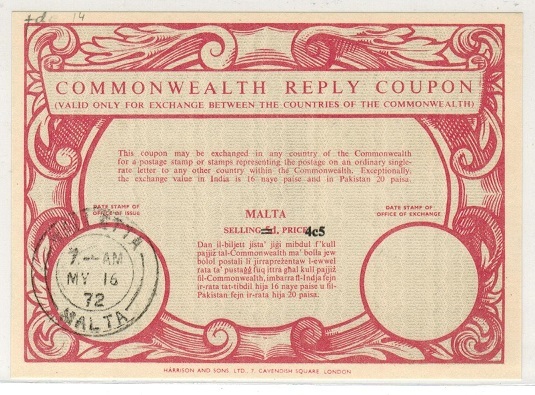 MALTA - 1972 5d red COMMONWEALTH REPLY COUPON revised '4c5' with black handstamp. 1972 (MY.16.) issued 5d red on cream 'COMMONWEALTH REPLY COUPON' cancelled at VALLETTA and with black revised '4c5' applied as selling price. MALTA - 1879 1d brown 'GB' PSC to UK in Malta. H&G 7. 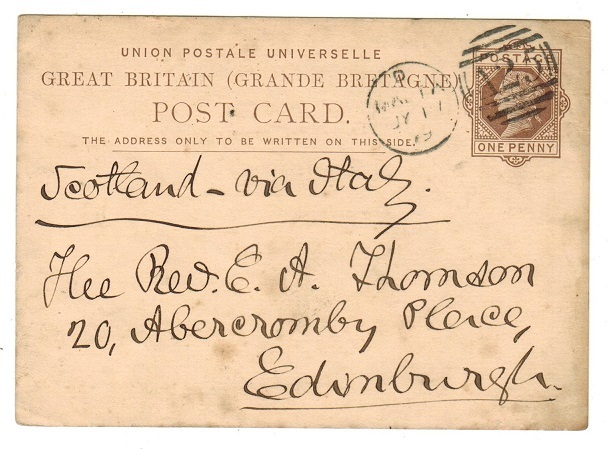 1879 1d brown on cream postal stationery postcard of GB (H&G 7) addressed to UK and cancelled by 'A 25' duplex with MALTA cds alongside dated JY.17.79. A scarce early use of this stationery in Malta. 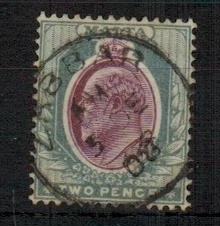 MALTA - 1902 2d uprated RPSE to Holland. 1902 2d Blue on grey text on cream registered postal stationery envelope addressed to Holland (size G) bearing additional 2d & 2 1/2d adhesives (SG 51+52) tied by 'A25' duplex with REGISTERED/MALTA cancel dated 4.AP.04. 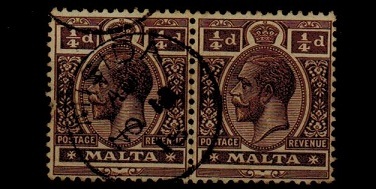 MALTA - 1914 1/4d brown pair cancelled MISIDA. SG 69. 1914 1/4d brown pair (SG 69-one with blunt perf) cancelled by fine central MISIDA s/r cds. MALTA - 1920 (circa) three local photographs. 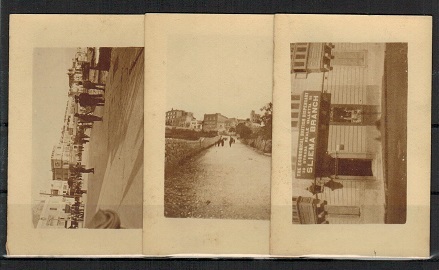 1920 (circa) range of three small sized photographs depicting 'Economical British Dispensary,Sliema Landing Place and Notabile scene'. Each 8x5cm size. 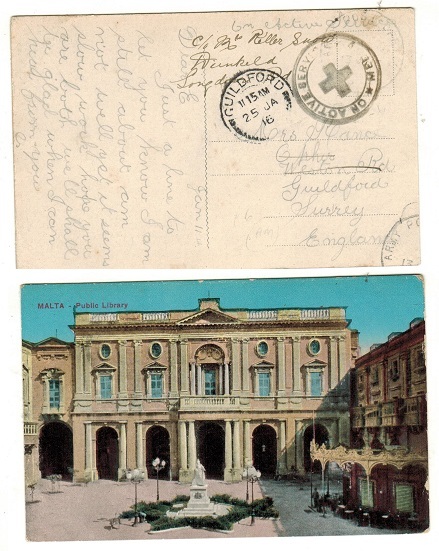 MALTA - 1905 inward ADVERTISED/GPO MALTA postcard from UK with '1d' tax marking. 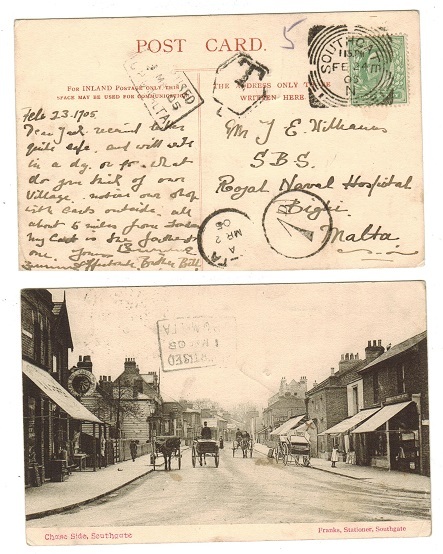 1905 inward picture postcard from UK with MALTA s/r arrival cds dated MR.2.05 and circular '1d' tax mark. 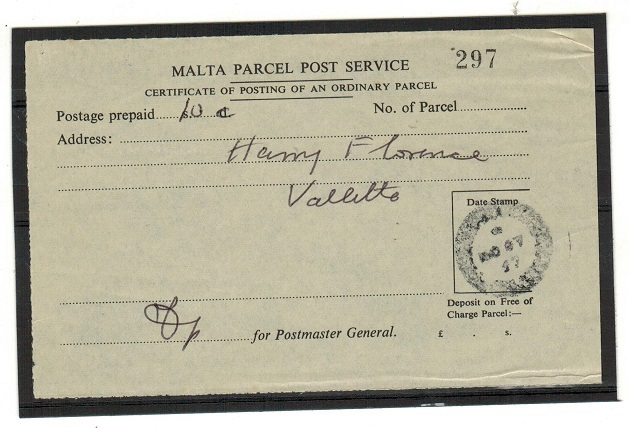 The card could not be delivered however and has a boxed ADVERTISED/GPO MALTA h/s applied to both sides. MALTA - 1903 inward postcard with POSTAGE STAMP LOST IN TRANSIT handstamp. 1903 inward postcard from Greece with the stamp having been lost and the card with slight faults having MALTA arrival cds dated 24.DE.03 code 'L' and with scarce boxed bilingual POSTAGE STAMP LOST IN TRANSIT h/s in black. 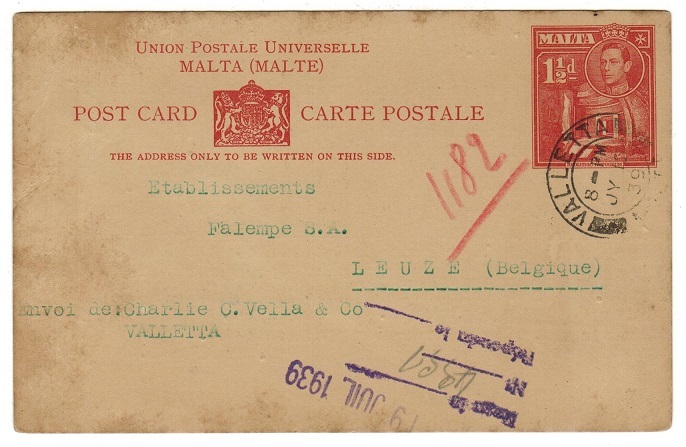 MALTA - 1939 1 1/2d dark red PSC to Belgium used at Valletta. H&G 17. 1939 1 1/2d dark red on granite cream postal stationery postcard addressed to Belgium (some light edge wear at left) but with full message on reverse and cancelled by VALLETTA/MALTA cds dated JY.15.39. A nice early useage. H&G 17. MALTA - 1953 'Return For Additional Postage' cover to USA. 1953 (NO.4) cover to USA bearing 'KGVI' 3d & 1/6d 'Self Government' adhesive (SG240a+ 244) tied VALLETTA/MALTA with light red boxed RETURNED FOR...S...D/ADDITIONAL POSTAGE/ DATE ....s....d Per OZ instructional h/s. (RL type PD-R1a). MALTA - 1920 RECEIVED FROM HMS SHIP use of postcard to UK. 1920 (20.5.) 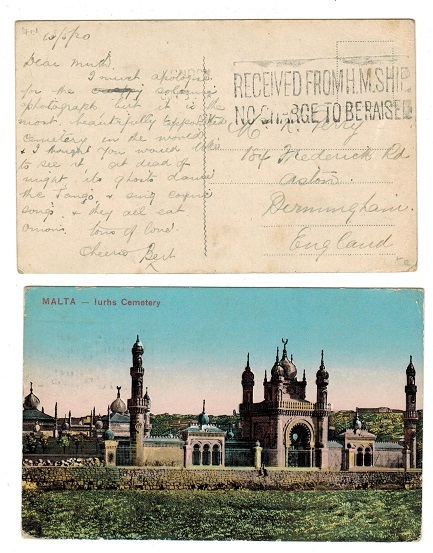 stampless use of picture postcard addressed to UK depicting 'Malta-Lurhs Cemetery' and struck by black two lined RECEIVED FROM H.M.S.SHIP/NO CHARGE TO BE RAISED. 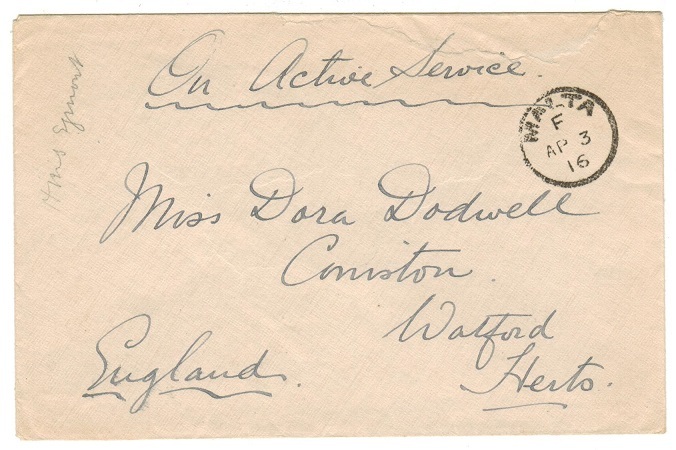 MALTA - 1916 'On Active Service' stampless cover addressed to UK. 1916 (AP.3) use of stampless cover to UK marked in manuscript 'On Active Service' & cancelled MALTA with code slug 'F' cancellator. MALTA - 1944 (circa) unused postcard depicting German bomber shot down on Malta. 1944 (circa) unused postcard depicting a German bomber having been shot down over Malta. 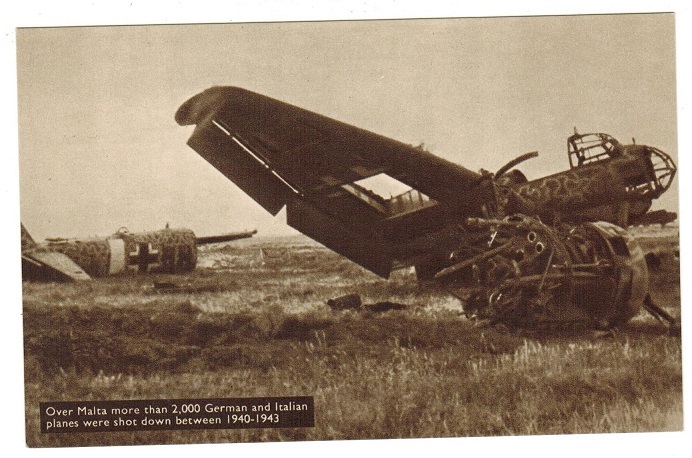 The caption reads 'Over Malta more than 2,000 German and Italian planes were shot down between 1940 and 1943'. A nice card.